Our everyday experience with light naturally leads to the concept of light rays. The propagation of light rays can be formulated in terms of a variational principle known as Fermat's principle of least time, which is the basis of classical or geometrical optics. 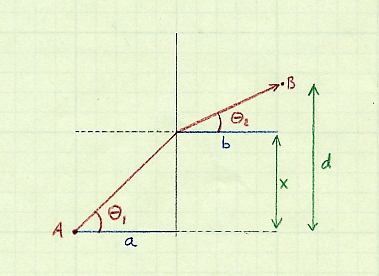 As shown in the Notes, this principle states that the path taken between two points A and B by a light ray is the path that can be traversed in the least amount of time. Put another way: because the speed of light $v$ is constant (expressed as the ratio of the speed of light in vacuum $c$ to the index of refraction $n$) along any path within a given homogeneous medium, the path of shortest time is a straight line. This program uses Fermat's principle and a simple Monte Carlo method to find the path of a light ray. Interestingly, the principle of least time—or, more broadly, least action—has inspired mathematicians to formulate new methods in number theory related to the rational solutions of Diophantine equations: Secret Link Uncovered Between Pure Math and Physics. This program applies a simple variational Monte Carlo method to Fermat's principle of least time in geometrical optics. $n_1 \lt n_2$ requires $\theta_1 \gt \theta_2 \to$ refraction toward the normal in region 2. How does program fermat work? The strategy here is to begin with an arbitrary path and make changes to the path at random. These changes are accepted only if they reduce the travel time of the light ray. Because light propagates in a straight line in each medium, the path of the light ray is given by the position $y(k)$ at each boundary $k$. The interface between the medium on the left and the one on the right is located at the boundary $k$ = 5. The bending of a light ray near an interface can be calculated using the known refractive indices of two materials using Snell's law of refraction, named after Willebrord Snellius, who described it in 1621, but discovered first by the Arabian mathematician Ibn Sahl in 984. In 1662, Pierre de Fermat produced an ingenious method of deriving Snell's law on the basis of the principle of least time. A light ray originating at point A is refracted upon crossing a vertical interface. Angles are measured relative to a normal line that is oriented horizontally at the contact point. The factors of $c$ cancel to give Snell's law, or $n_1 \sin \theta_1 = n_2 \sin \theta_2$.